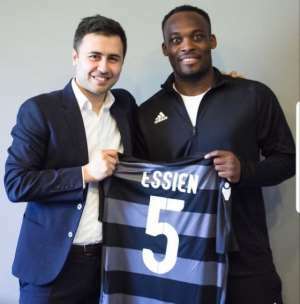 Michael Essien, who left Indonesian side Persip Bandung last year, signed a 15 month deal with the club until May 2020. The former Chelsea and AC Milan star has taken up the opportunity to play for the European team and to also join the club’s U-19 coaching staff to acquire coaching experience as part of his journey to taking up a career in the dugout. Essien, 36, will join his new teammates after the international break and play till the end of the season then restart next season. He will also assist U19 coaching team for his experience as part of completing his UEFA B qualification, a continuation of the coaching work he has been doing with Chelsea U16.